Shop owners and other businesses in the Nishijin and Kitano areas in Kyoto's Kamigyo Ward have newly prepared two hands-on programs using traditional art materials as part of efforts to draw more foreign tourists as well as students who come to the western city from other parts of Japan on their school trips. The programs of free painting on paper fox masks and creations of "kumihimo" colorful traditional threads were jointly developed by the association of Taishogun Shopping Street, also known as Yokai Street for various events featuring Japanese "yokai" monsters, and the Kitano neighborhood construction society. The organizations say they began in 2018 promoting the programs during their visits to tour agencies and schools, which met with favorable reactions. 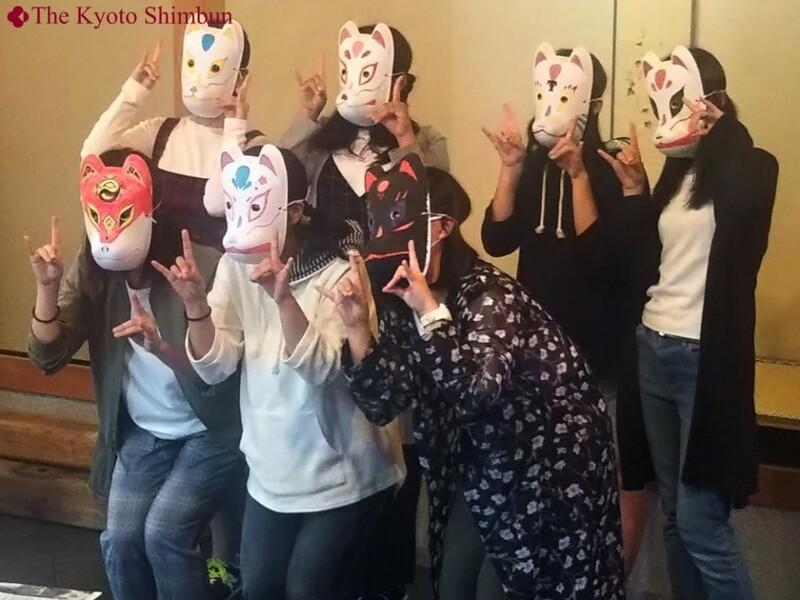 Participants in the "fox mask" program first learn various stories about yokai monsters related to related to Ichijo Street, which runs through the Taishogun shopping district, during the academic event at Daishogun Hachijinja, a Shinto shrine. Afterward they draw painting freely on paper fox masks in the second half of the program, which charges each participant 1,500 yen. In the other hands-on program, participants learn how to create bracelets and other accessories using colorful threads called Kyokumihimo, which is a Kyoto-oriented format of kumihimo art, at Meikyo-An store. An increasing number of teenage students are interested in kumihimo after the traditional art was depicted in various ways in the 2016 blockbuster animation film "Kimi no Na wa (your name. )," according to the organizers. The starting price for the kumihimo program is 2,200 yen. The area is near Kitano Tenmangu, a popular tourism spot, but fails to have as many tourists as they wish as it is somewhat away from main routes for tourists. Akira Inoue, president of the Taishogun Shopping Street Association, said local businesses plan to release more original hands-on programs. "We want to make the Nishijin and Kitano area a third-largest tourism spot (in Kyoto) following the Higashiyama and Arashiyama areas," Inoue said.